“Hold my Spot” non-refundable deposit $100. All are welcome. Class size limited to about 20 participants. Questions? 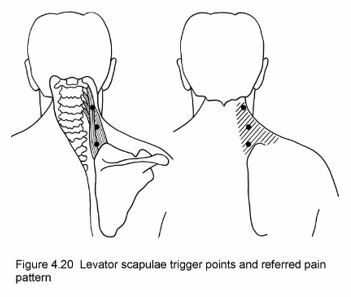 A Crick in the Neck is not going to be a 4-day ordeal if you massage the trigger points in your levator scapulae and trapezius muscles. Yep, that “I-must-have-slept-wrong. 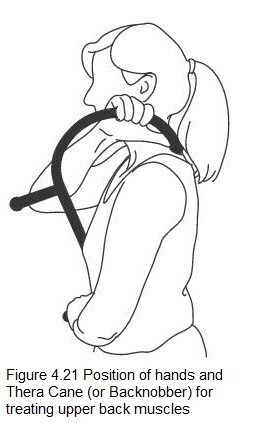 I-can’t-turn my-head” thing is muscle pain. You could have immediate relief with self-treatment. Does this look like where you have pain? These classes will show you where to find the source of the pain and how to treat it yourself. Do you want to learn how to find the source of the pain and treat it yourself? Do you practice self-treatment and tell everyone you know about trigger points? Do you suffer from chronic pain and use self-care regularly as a coping strategy? Are you a yoga teacher, personal trainer or other fitness and health enthusiast? Do you already love The Trigger Point Therapy Workbook, but want to know more? This class is for you. We will dive deep into The Trigger Point Therapy Workbook, Your Self-treatment Guide for Pain Relief, 3rd ed and explore many new ideas about how to get out of pain and stay functional. Being able to massage away your pain anytime, anywhere is an invaluable life skill you will used your entire life. This 2-day class is led by Amber Davies herself! 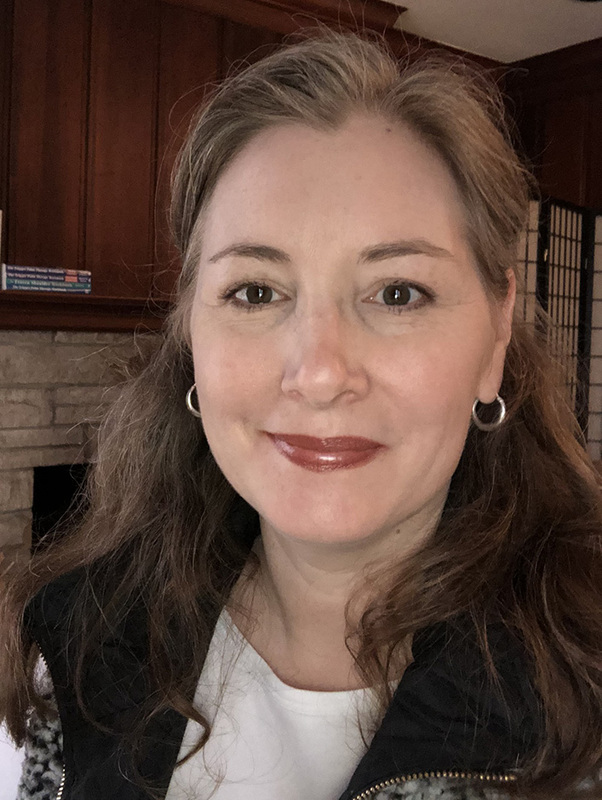 As you know, Amber is the co-author of the internationally best-selling The Trigger Point Therapy Workbook 3rd edition which has become a classic in the fields of trigger point therapy, massage, and self-care. Amber assisted her father, Clair, in the development of these self-treatment techniques, assisted him in workshops, and revised the book after his death in 2006. This is a rare opportunity to learn from a leader in the field of self-treatment. Your personal understanding of the details of palpation and location of trigger points will be a primary goal of this class. This won’t be a class of hundreds where you will sit for hours getting more trigger points listening to an ‘expert’ drone on about how much you need what they are selling. No, this a small class setting where you will be exploring your own trigger points, perpetuating factors, and self-treatment techniques while guided personally by Amber. You can’t do this right in a class of hundreds. This class is limited to around 20 participants giving you ample time for personal attention. These classes will sell out so sign up today. If you are interested in teaching others how to find and treat their trigger points in a health and fitness setting this class will enhance those skills. If you can find it on yourself, you can find it on other people. You will also learn about a wide variety of pain experiences from the participants around you and their experiences using this method. This isn’t one size fits all or no pain, no gain. 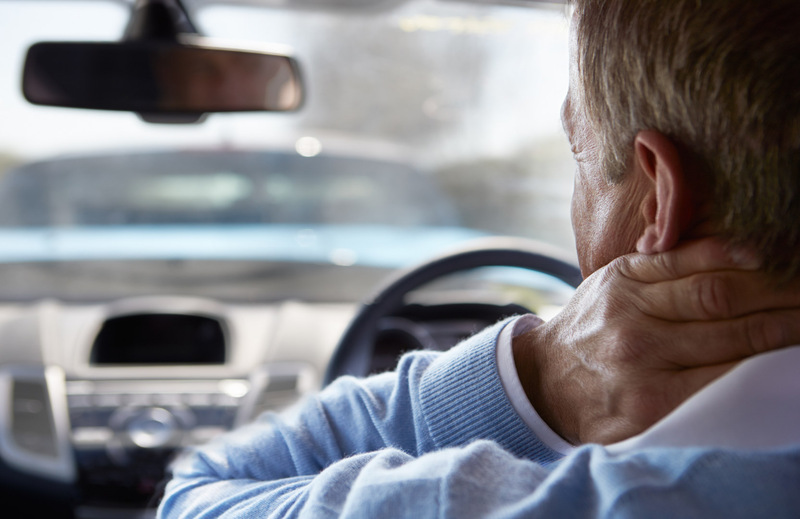 Chronic pain is treatable and preventable with self-treatment if you know how to do it. Quit chasing the pain, learn the referred pain patterns that are central feature of trigger point therapy. The problem is not in the place that hurts. 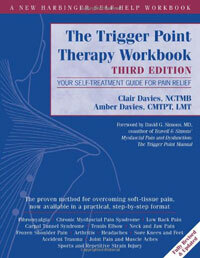 The Trigger Point Therapy Workbook 3rd edition is required for class (not included in tuition). Pre-order your copy now at Amazon. We will also have books available for sale before class but reading in advance really helps. I’ve been in chronic pain forever and I’ve tried everything. Is this really going to help me? Maybe. That is the best most honest answer I can give to you. 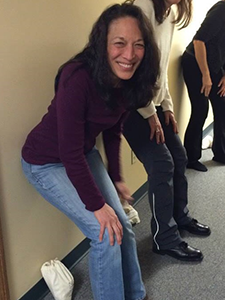 Are you going to leave the class after 2 days with significantly less pain and stiffness? Maybe. It’s possible. It has happened many times. Many people who have had been in pain for years have found profound relief or even complete recovery with this therapy. It is also possible that traveling to and from plus attending the class will flare your pain and make you feel worse. Sometimes it takes weeks of diligent self-treatment combined with lifestyle and habit changes to have significant relief. There is a lot to consider. Before registering for the class, let’s talk. Email me and we will make a time to talk about your condition, your response to previous treatments, and if this class is a good fit for you. I am a personal trainer who has been trigger pointing my clients using your book. Is this the right class for me and why can’t I come to the professional CE class? The professional classes are designed for massage therapists and other clinicians who are treating people in a clinical setting. At this time, the self-treatment classes are better suited for non-clinicians who are used to treating people in a more informal setting. Further, the key to mastering trigger point location and palpation is to be able to find the trigger points on yourself. Ideally, you will be teaching your clients self-care as well. You will learn a lot watching me teach and interact with the other participants. I’ve done a lot of foam rolling what will this class teach me that I don’t already know? In short, why and where to treat. It is estimated that 85% of the time the problem is not in the place that hurts. Most self-treatment resources just direct you to massage or roll where the pain is, leading to over treating secondary trigger points that are not main problem. 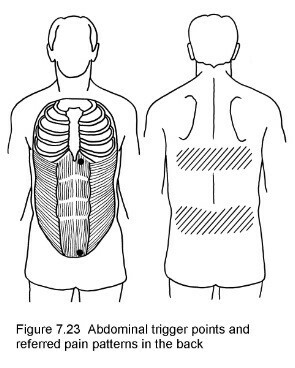 There are few resources that both show you the referred pain patterns and tell you how to get to the trigger points that are causing them. Further, most people cannot get down on the floor and lean their entire body weight on a hard roller. This therapy uses simple inexpensive tools like rubber balls to self-treat anytime, anywhere. Probably not anytime soon. It has been difficult for me to travel far from Kentucky to teach classes because my children are still young. It simply works better for my family if I stay at home. Louisville, KY is lovely and lively city. We are becoming a culinary hot spot and often listed among the top cities to live and visit. Can I get an appointment with you while I’m in town for the workshop? Yes, I do have a limited number of appointments available in the days before a workshop especially for workshop attendees. Call me to schedule rather than using the online appointment scheduler. I have the second edition of the Trigger Point Therapy Workbook. What is different about the third edition and do I need it for class? Any other questions or concerns? Contact me today and we will talk.